An entity–relationship model (ER model) is a data model for describing the data or information aspects of a business domain or its process requirements, in an abstract way that lends itself to ultimately being implemented in a database such as a relational database. The main components of ER models are entities (things) and the relationships that can exist among them. Entities are objects or concepts that represent important data. They are typically nouns, e.g. customer, supervisor, location, or promotion. Strong entities exist independently from other entity types. They always possess one or more attributes that uniquely distinguish each occurrence of the entity. Weak entities depend on some other entity type. 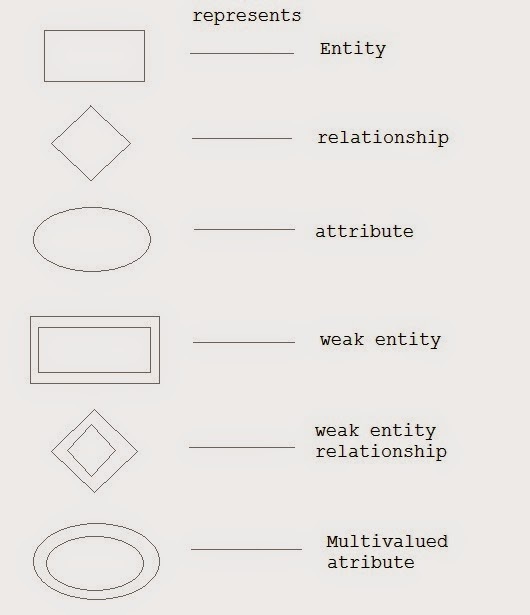 They don’t possess unique attributes (also known as a primary key) and have no meaning in the diagram without depending on another entity. This other entity is known as the owner. Associative entities , the entity describes a connection between two entities with an otherwise many-to-many relationship, for example, a student can registers in many course and a course can have many student. Relationships are meaningful associations between or among entities. They are usually verbs, e.g. assign, associate, or track. A relationship provides useful information that could not be discerned with just the entity types. Weak relationships, or identifying relationships, are connections that exist between a weak entity type and its owner. An Attribute describes a property or characterstic of an entity. For example, Name, Age, Address etc can be attributes of a Student. An attribute is represented using eclipse. An attribute can also have their own attributes. These attributes are known as Composite attribute. A Relationship describes relations between entities. Relationship is represented using diamonds. There are three types of relationship that exist between Entities. Binary Relationship means relation between two Entities. This is further divided into three types. One to One : This type of relationship is rarely seen in real world. 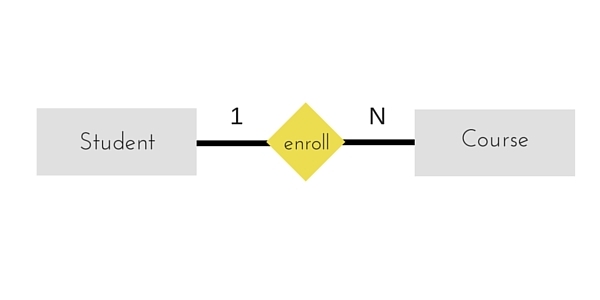 The above example describes that one student can enroll only for one course and a course will also have only one Student. This is not what you will usually see in relationship. One to Many : It reflects business rule that one entity is associated with many number of same entity. For example, Student enrolls for only one Course but a Course can have many Students. 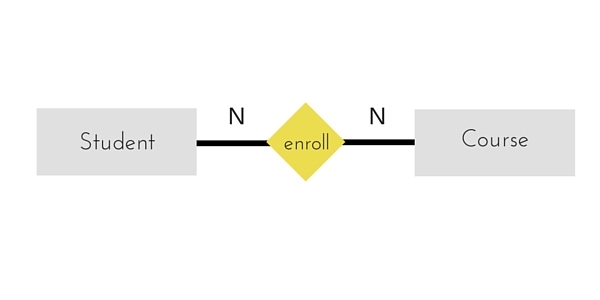 The above diagram represents that many students can enroll for more than one courses. When an Entity is related with itself it is known as Recursive Relationship. Relationship of degree three is called Ternary relationship. Good information, most importantly useful. I advise you in the future be used for the presentation takioy information. It is very convenient to see slide with description. This makes it easy perception of information. 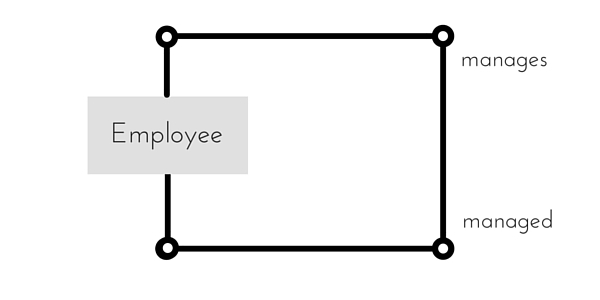 If you want, here is a good template for this http://www.pptstar.com/diagrams/. I hope it will be useful to you. Good luck.